Manifesting as a curiosity collectors’ trophy room, Jordan Elise Perme‘s Bachelor of Fine Arts thesis show at the Cleveland Institute of Art included a hand-drawn field guide, tintype photographs documenting her “hunting”, and an array of faux taxidermied creatures adorning the space. Essentially a room-sized cabinet of curiosities, this 2009 installation was titled A Cabinet of Curious Fictions and one could argue that it is the true origin of Perme’s soon-to-be-coined Horrible Adorables alias. But what, as most would wonder, exactly is a horrible adorable? Or, more specifically, what makes them both horrible and adorable? And it is perhaps this latter query that Perme and Christoper Lees, her husband and collaborative partner in the Horrible Adorables venture, are answering with their newest solo exhibition, The Horrible Adorable Show. 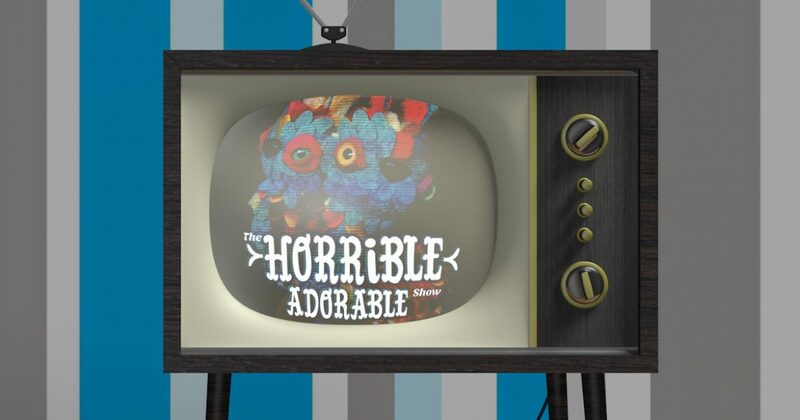 A horrible adorable is a strange creature that hails from a fantastical land, each one being a hodgepodge of actual animals reimagined together to create a new, fanciful whole. Given names like Foxolotl, Haremus, Slodent, and Sweasel Kit, these beasts and the world which they inhabit have steadily taken shape since the brand was officially formed in January of 2010. With each piece starting as a hand-carved foam form, similarly named creatures stemming from similarly shaped inner sculpts, these one-of-a-kind works develop their unique features through the affixing of wool felt scales and other finishing touches, including eerily realistic glass eyes. And it is these carefully applied exteriors that not only imbue them with an otherworldly appearance but also with individual personalities, ones that tend to embrace both the sinister and the sweet, the horrible and the adorable. With The Horrible Adorable Show, Perme and Lees have created a divide within their imaginary animal kingdom, taking each form represented and manifesting it in both Horrible and Adorable renditions. Thus the pom-pom tailed Adorable Pufflerump can meet its disturbingly detailed counterpart, the Horrible Pufflerump with its lolling tongue. And while one could interpret this simply as being good versus evil, such a strict dichotomy doesn’t do justice to these creations; each may lean more towards the Horrible or the Adorable side, but they all still retain a bit of the other, remaining true Horrible Adorables. Horrible Adorables’ The Horrible Adorable Show solo exhibition at Clutter Magazine Gallery had its opening reception on Saturday, September 8th from 6-9pm. All works in this exhibition will remain on display until October 5th, 2018 at the gallery’s physical location (163 Main Street, Beacon, NY 12508).